McIlroy vs. Oosthuizen: Whose swing is the sweetest of them all? Louis Oosthuizen shot a six-under 66 to move into third place. Rory McIlroy outlasted Louis Oosthuizen in Monday's final round of the Deutsche Bank Championship. The two were paired for two straight days, and we got to watch more than just a fantastic duel. We got to watch two of the sweetest swings in golf. I asked about a dozen PGA Tour players after their rounds at TPC Boston on Labor Day: Who has the better swing, McIlroy or Oosthuizen, and why? Tough question. The pros weighing in had a hard time picking (two of them were even offended and a little defensive when asked), but in this contest Oosthuizen beat out McIlroy by a decisive margin. 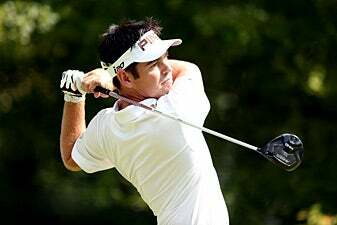 Oosthuizen, the sweet-swinging South African, has a simple and compact swing, which many consider the most fundamentally sound on the Tour. Jim Furyk, known for his unconventional action, opted to stay neutral, but he spoke of his appreciation for both swings. "Louis has power, but he's also extremely rhythmic," said Furyk. "He hits the ball both ways. I don't know if there's (a swing) fundamentally better in the world. "Rory hits the ball right-to-left, and I don't see him cut the ball much, but he's more explosive and has the ability to really light it up when he gets hot." Added Chris Kirk, whose natural ball flight is a sweeping, high draw: "They're both so good, it's hard to pick. I bet everyone is saying that. With Rory being more of a draw-er and Louis more of a fader, I think I can relate more to Rory's swing, and it's what I wish my swing were more like." Keegan Bradley said he admired their swings for different reasons. "I like Rory's because it's powerful, and I like Louis' because it's so consistent." World No. 2 Luke Donald echoed the rest and said it was obviously difficult to pick between the two, but he gave Oosthuizen the edge "in terms of sound mechanics." "I like Louis'," said Donald. "I just feel like it's so up and down. It looks so simple and repetitive." Bo Van Pelt had a front-row seat to Oosthuizen's swing because they were paired together the first two rounds in Boston. "You're splitting hairs," said Van Pelt, with a smile as he signed autographs. "But I'll say Louis. I think the ball doesn't curve that much, and I love his rhythm. It never looks like he forces it. Rory hits it a ton, but he looks like he tries harder to hit it that far. "Whereas I played with Louis, and it looked like he was going 80 percent. His power is very efficient." McIlroy averages 310 yards on drives measured in PGA Tour rounds this season, a tie for sixth with Dustin Johnson in the Driving Distance stat. Though Oosthuizen has a smaller build compared to the world No. 1, he's not far behind, averaging 298.9 yards off the tee. Fellow South African Ernie Els, nicknamed "The Big Easy" for his effortless and fluid swing, picked Oosthuizen, echoing Van Pelt's comments. "Thing of beauty, both of them," said Els. "I think Rory goes after it harder than Louis does. It's hard to make negative on either swing. Louis is a little smaller than Rory, but he generates unbelievable power without trying. With Rory it looks like he's really cracking a whip." The 2012 British Open champion smiled and added: "And I'm probably biased."